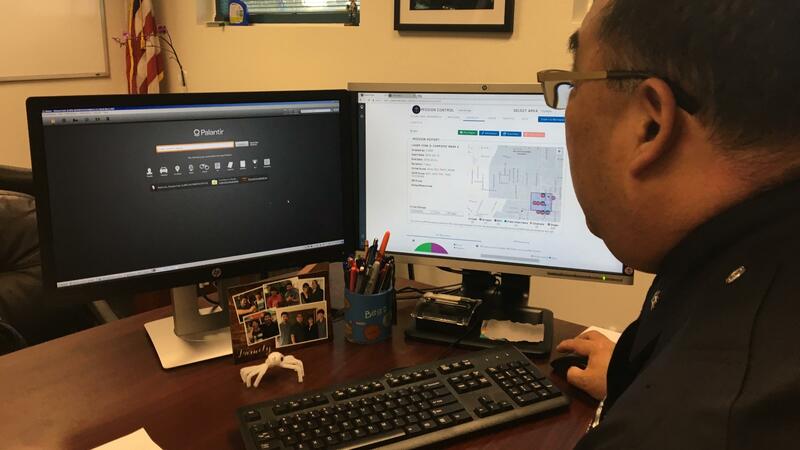 LAPD Deputy Chief Dennis Kato tracks crime statistics in near real time and searches across databases using new, more powerful analytics tools. Lt. James Hwang and Capt. 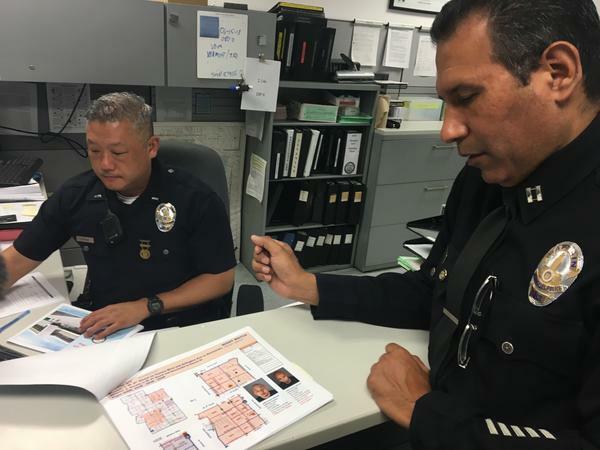 Alex Vargas review the "mission sheet" for officers patrolling the Olympic Division. It's generated with various analytics tools, and points patrol officers toward certain neighborhoods and people. 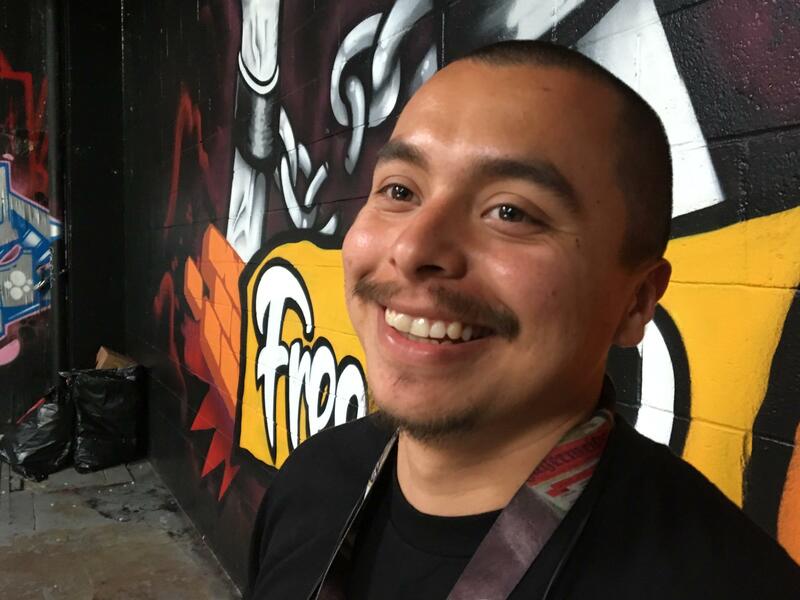 Anthony Robles, an organizer with the Youth Justice Coalition, believes data-driven policing is just another form of older policing techniques, such as gang affiliation lists. "I would have to log into 19 different databases," says Los Angeles Police Department Deputy Chief Dennis Kato. "I'd log in, print out all the tickets that were written to you, and lay them on my desk. Then I'd go and run your criminal history on another database, and print that out. And then another database to see how many times your name was associated with crime reports." Now he can see all that information on one screen. Kato has been instrumental in LAPD's rollout of a data search program sold by a company called Palantir. While Palantir is somewhat controversial because of its secrecy and reliance on national security contracts, its product for police isn't that mysterious. Like Palantir, other companies make similar "relational database" tools, which combine data from different sources to get a bigger picture quickly. One of Kato's analysts, a civilian named Andrea Costa, demonstrates how it works. She says it's a bit like doing a Google search. "So we have the name," she says, typing it into a search bar. "And it's linking to a residence, 'user of this phone number,' 'associated with this vehicle,' 'works in that address.'" The "linked information" pops up in bubbles around the suspect's name, with lines showing the degrees of connection. If the suspect's name was tangentially mentioned in someone else's arrest report, that pops up, too. It's akin to when your smartphone finds a street address in one of your emails, and adds it to your address book. "We've always had this data," Kato says. "Now I can start seeing these patterns build." The faster data analytics extends to crime mapping, too. LAPD has been expanding "Operation LASER," which uses near-real-time crime data to adjust police patrols on a daily or even hourly basis. By contrast, older systems, such as the vaunted "Compstat" — pioneered in New York in the 1990s — mapped crime much more slowly. In the divisions of LAPD now using LASER, officers are given "mission sheets" with instructions to focus on very specific areas, sometimes just a few blocks big. The missions are written by their local supervisors, but with heavy input from the real-time crime mapping, as well as another analytics tool called PredPol. It uses an algorithm to predict the location of future property crimes. At the Olympic Division station, Officer Jennifer Ramirez reviews her daily mission sheet printout. She eyes the areas she'll target, "because these are the hot spots, these are where the crimes tend to happen, this day, this time, based on the crime mapping that we do." Ramirez has faith in the analysis, because she's convinced crime is cyclical. But her mission sheet doesn't point her just toward certain places. It's also pointing her toward certain people. Her mission sheet comes with mug shots and names. "These are people that we are going to be looking out for, who are our chronic offenders," she says. The "Chronic Offenders Bulletin" may be the most controversial element of LAPD's new data analytics strategy. It's a list of the people in a certain neighborhood who police think are most likely to commit crimes. Chronic offender status is based on a point score, which is calculated on the basis of his previous interactions with the justice system, or membership in a gang. The LAPD's new data search tools make calculating that score much simpler. Small print across the top of the Chronic Offenders Bulletin warns that it's "Info only... not PC [probable cause] for arrest." But officers are encouraged to interact with the chronic offenders to the limit allowed by the law. "It's just disruption of crime," says Deputy Chief Kato. "When you see Johnny Jones walking down the street and he's a chronic offender, you should pay attention to his activity. Now if you have a lawful reason, constitutionally, to stop him or detain him, then do that." LAPD says it does not publish the Chronic Offenders Bulletin, for reasons of privacy and police operations. But Kato says if someone walked into a station and asked to find out if he's on it, Kato would tell him. "They're just reinventing their surveillance techniques and machinery," says Anthony Robles. He's an organizer with the Youth Justice Coalition, an activist group run by young people who've been incarcerated. "Every time I drove out of that block, or drove anywhere, I'd get pulled over. A lot of times they'd search my car they wouldn't find anything and they'd give me a moving violation." Robles believes the increased scrutiny did little to keep him on the straight and narrow. "It led to a lot of anger — it made me want to do something bad!" Jamie Garcia is with another activist group, the "Stop LAPD Spying Coalition." The group sued to get more details about the new analytics tools — including the chronic offenders list. She thinks the only thing that's new here is what she calls the scientific "veneer." "These programs are nothing new, in the history of policing," Garcia says. "What they are trying to call science is pseudo-science." For instance, the chronic offender formula is partly based on how often you have contacts with the police — "field interviews," she says. And those contacts are simply more likely in a place that already has more police patrols. "The bias is still very much inherent in the data that is being used, and the same communities are being impacted," she says. The LAPD's Kato thinks data-driven policing is having the opposite effect. He says the long-term crime trend in Los Angeles is downward — and crime is far lower than it was a generation ago. "But you know what? So's our arrest numbers," Kato says. "So that's a good thing, right? Because that means we're arresting the right people. We're not out there saturating, we're not out there picking up people for everything." At the same time, Kato is willing to consider that the system might have flaws. "If you put in bad data, you're going to get bad data," he says, and he's always willing to revisit the system to make sure it isn't skewed against certain neighborhoods. "We've got to figure out, 'What (are) the boundaries? How much is good data? What are the input mechanisms?' We question this stuff all the time." Even inside policing, there are differing attitudes toward data-driven policing. "Officers are not all necessarily gung-ho about it," says Sarah Brayne, a University of Texas sociologist who spent months with the LAPD for a long-term study on how the department uses data-integration technology. "In general, people in managerial roles in the police department were more receptive," she says. Front-line cops were less enthusiastic, she says, because "a lot of the new data collection mechanisms are means by which the police themselves come under surveillance." She says initially, the police union resisted turning on automatic location devices that could help the system keep track of "dosage" — that is, the frequency with which a squad car drove through designated hot spots. Eventually, officers relented, and the system now tracks cars' minutes inside LASER zones. "It's supposed to be an accountability mechanism, but when it creeps into being a performance metric, that's when officers get annoyed," Brayne says. But she adds that even some managers have doubts, especially when it comes to systems such as the Chronic Offender Bulletin. "When I asked captains in other divisions whether they were going to implement Operation LASER, [some of them] would say, 'No, I'm not going to touch that with a 10-foot pole! That's a civil liberties nightmare.'" Still, there's steady pressure for them to accept the new systems. Kato says the department believes the use of Operation LASER in certain pilot divisions helped Los Angeles to control a recent spike in violent crime. He's helping to roll out it out to all the divisions of the LAPD by 2020. We live in an age of big data as our daily decisions are increasingly steered by computers. This week on All Tech Considered, we learn how the police are catching up with the rest of us. CORNISH: Big police departments are relying more and more on data to decide where to patrol and even whom to keep a close eye on. But as NPR's Martin Kaste reports from Los Angeles, some people worry that data-driven policing is just a high-tech cover for old-fashioned profiling. UNIDENTIFIED PERSON #1: So we have the name Joseph. MARTIN KASTE, BYLINE: You probably already assumed that the police could do this kind of search - type in someone's name and see what pops up. UNIDENTIFIED PERSON #1: It's linking it to a residence, you know, user of this phone number, associated with this vehicle, works in that address. KASTE: But actually, this is kind of revolutionary. TV cops do this all the time of course. But in real life, police information systems are often clunky with different kinds of information kept in separate silos. Cops spend hours logging into the different systems, printing stuff out, collating it all by hand. But lately, some bigger departments have finally set up internal search systems that can combine all this in one place, on one screen. And the Los Angeles Police Department is one of them. UNIDENTIFIED PERSON #2: Hollywood's on. UNIDENTIFIED PERSON #1: Thank you. Wilshire. UNIDENTIFIED PERSON #3: Wilshire's on. KASTE: When you listen to the daily crime conference call here, the effect of these new data tools is obvious. The crime stats are up-to-the-minute, tracked and mapped in granular fashion. UNIDENTIFIED PERSON #4: So Hollywood - so I see yesterday we have one robbery, three burglary for motor vehicles. So what's going on? KASTE: You probably remember CompStat. That was the crime tracking system pioneered in New York in the 1990s. But this is much faster. Instead of looking at last week's statistics, LAPD is analyzing crime trends within hours and responding almost as quickly. It's an ever-shrinking feedback loop that directly affects the assignments of cops on the street like Jennifer Ramirez. JENNIFER RAMIREZ: So basically this is what we get on a daily basis. And we take out a mission sheet. KASTE: Ramirez patrols in the department's Olympic division, which includes Koreatown. The mission sheet she mentioned is generated by her captain and lieutenant using a variety of software tools. And it includes detailed maps of problem areas that the LAPD calls LASER zones. RAMIREZ: I want to make sure that I try and spend as much time in this area of my free time because these are the hot spots. These are where the crimes will tend to happen. KASTE: And this system isn't just putting officers at certain places. It's also pointing them at certain people. Ramirez's mission sheet also comes with names and photos. RAMIREZ: These are people that we are going to be looking out for in the area who have been our chronic offenders. KASTE: Chronic offenders - this may be the most sensitive aspect of the LAPD's recent data analytics push. Each of these LASER zones comes with a list of the top people that the cops are supposed to watch for. Membership on this list is determined by a formula that draws on data about past interactions with the justice system. The cops are supposed to try to interact with these people as much as possible sort of as a warning to stay out of trouble. But to Anthony Robles, it all sounds way too familiar. ANTHONY ROBLES: They're just reinventing their surveillance techniques and machinery. KASTE: Robles is an organizer with the Youth Justice Coalition. It's an activist group run by people who've been incarcerated. He was one of the plaintiffs in a lawsuit against the LAPD's long-standing gang injunction system which relied on lists of people that the police categorized as gang affiliates. He recalls what it was like for him as a teenager when he was on that gang list. ROBLES: Every time I drove by to that block or drove anywhere, I'd get pulled over. A lot of times they would search my car. They wouldn't find anything, and then they would just give me, like, a moving violation ticket. It led to a lot of anger. It made me want to go do something bad. KASTE: This gang list system now seems to be on its way out, but Robles thinks it's being replaced by the Chronic Offenders Bulletin and the LASER zones and the other data analysis tools. And Jamie Garcia agrees. She's with an activist group called the Stop LAPD Spying Coalition, which sued to get more details about how the department is using data. JAMIE GARCIA: These programs are nothing new in the history of policing. What they're trying to call science is really pseudoscience. The bias is still very much inherent in the data that's being used, and the same communities are being impacted. KASTE: For instance, she says the formula for determining whether someone's on the Chronic Offenders Bulletin is based partly on how often someone is interviewed by the police. But that's something that's simply more likely to happen in those places with heavier police presence. To her, it's just a vicious cycle with a high-tech veneer. But inside the LAPD, the brass are pleased with the new data tools. KASTE: Dennis Kato is a deputy chief who's been tasked with helping to roll out these new analytics systems to all of this sprawling department's divisions by 2020. He says what people have to remember is that compared to a generation ago, crime in this city is much lower. KATO: But you know what - so is our arrest numbers. So that's a good thing - right? - because that means we're arresting the right people. We're not out there saturating. We're not just picking up people for everything. KASTE: At the same time, Kato says police do need to be careful as they get more, as he puts it, creative with the data. KATO: We've got to figure out, what is the boundaries? How much is good data? And what is the input mechanisms? And all of that's happening. We question this stuff all the time. CORNISH: And Martin joins us now to talk a little more about how police are using data. And, Martin, just start with a clarification here. Is the LAPD getting new kinds of data? KASTE: It's not really new data, Audie. What we're talking about here is a new way to access the data they already have in about 19 databases. They say this is all just information in government-created databases like licenses and arrest records, that kind of thing. What they're doing, though, is - you know, these things are in silos. They're separate. They have some software by a company called Palantir that lets them sort of search across it and look for relationships. Now, this is not unique. Palantir gets a lot of press because there's a lot of sort of suspicions about their contracts with the federal government, with national security contracts. But really other software can do the same kind of thing. It's called sort of relational databases. But really what we're talking about here is just speed and ease of searching across a lot of different kinds of data. CORNISH: Besides the concerns we heard in this story about profiling certain people or neighborhoods, are there broader concerns just about privacy? KASTE: Yeah, there may be. I mean, as I said, this is easier now to look at different kinds of data, a lot less time logging into different things. And where there's ease there's temptation to abuse it. In California, there's been some discussion about incidences of police officers inappropriately getting into something called the C-L-E-T-S or CLETS database, which is DMV information. There's been some pressure on them to police that better, so to speak. And so you can imagine if an officer has access to a computer where he can sit down and just search a lot of stuff all at once with one screen, yeah, there might be some temptations. CORNISH: And is there a limit at least on how long they can hold onto all this information? KASTE: Well, there are some practical considerations involving storage. One example here is the license plate reader data. You probably know about license plate readers in cars. As the squad cars drive around, they're just gathering up all the license plates that they spot. It gets stored. You can recreate on a map where a car has been. It turns out they're keeping that indefinitely. You know, if it bugs you that someone in the LAPD could reconstruct where you've driven over the last few years, I just talked to Deputy Chief Kato, who's in this story, about that. He says it looks like they have yet to delete any of that data. So going back to when they first started doing that, they could probably reconstruct where a car in LA has been. CORNISH: That's NPR's Martin Kaste. Martin, thanks for your reporting. (SOUNDBITE OF EVIDENCE'S "DARKER CLOUDS (INSTRUMENTAL)") Transcript provided by NPR, Copyright NPR.